Norma Neverson, Candace Gurley, Else Stephens, Anne Bachus, ASH? 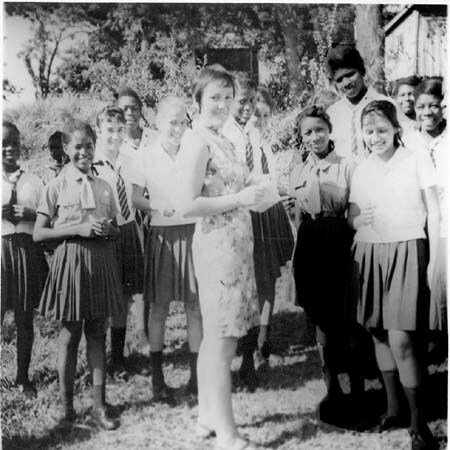 and in the back row (l-r) #6 is Elizabeth Harold and #9 (extreme right in glasses) is Pearlie Agard. The person in the front row is Sandra Ash (far right). 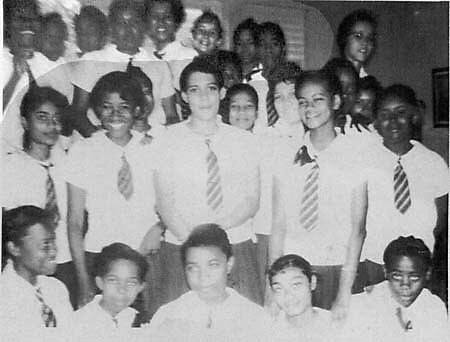 DeFreitas (far back), ?, Shermain Walker (tall girl), Cherrie Bowman, Anes Brown, Sandra Bramble. Thanks to Rose Anne Dacosta for submitting this. must have been their prefect. name "Serena"? she was Serena Tony not sure if she got married. It is truly a wonderful idea.